How Does Airplane Wi-Fi Work ? Air travel has been a mostly phone-free zone for many years. We've had to turn off our electronic devices and rely instead on movies and in-flight magazines for fun. it usually worked by transmitting an internet connection to a transponder attached to the plane using satellites, similar to how folks in rural areas without cable DSL or fiber infrastructure use satellite dishes to get online. but they obviously only work over land, and there are other disadvantages too not only do these towers suffer from geographical restrictions, but the service they provide can be painfully slow as anyone who is ever tried to stream anything on a plane probably knows. Did you find this blog helpful? Socialize With Us! ATG systems don't provide great speeds, usually somewhere in the neighborhood of about five megabytes per second, satellite internet is faster with speeds of up to 50 megabytes per second on what's called the Ku band which is the same range of spectrum used to be satellite TV to your house, but with how many people can fly on an average commercial airliner, even a 50 megabytes connection can mean doing something as simple as downloading a pdf file, it can be very slow if lots of passengers are connected at the same time. Current tech also requires airlines to pull bulky antennas onto their planes, these are heavy enough to have a significant effect on the plane's weight and aerodynamics meaning higher fuel costs which are passed along to you. Nowadays, major air carriers are now starting to install cob Ka-band satellite antennas which have the potential due to their higher bandwidth to reach hundreds of megabytes per second, enough for streaming even on a crowded plane where lots of people are trying to connect. 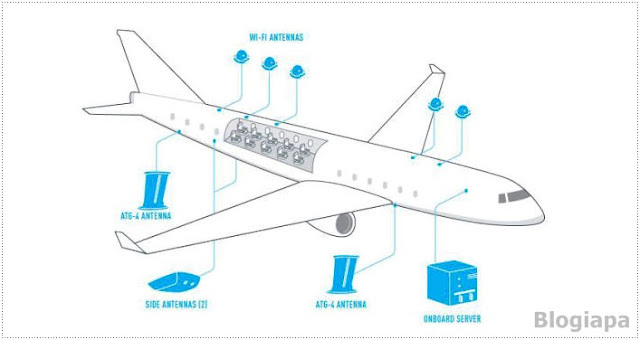 Read more at "How Does Airplane Wi-Fi Really Work"? Blogiapa - Learn To Do More! : How Does Airplane Wi-Fi Work ?